Exclusive Tips & Travel Deals From Croatia! Although we live in Porec, and honestly for many reasons we wouldn't live anywhere else in Istria but here, we always admit that Porec doesn't abound in good restaurants. The town is almost pathetic when it comes to eating out. Many places cater exclusively to tourists and locals rarely (if ever) eat there. Our favorite place to eat in Porec (or rather in the vicinity) is konoba Daniela. 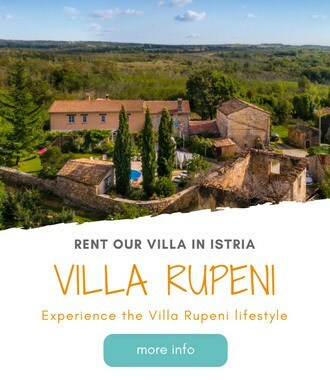 And while we love eating there, and we find the owners to be extremely nice and accommodating, it doesn't top our favorite restaurants to eat in Istria. However, there is a nice restaurant located at Porec seafront promenade. A restaurant we've always feared too fancy and too expensive to our taste (perhaps because of all yachts people who eat there on their visit to Porec). It's a restaurant Sv Nikola. Perhaps the best place to eat in Porec. And while the place is elegant (very elegant), and just a little bit pricey, it's a must-try restaurant in Porec. The service is top-notch. And I mean it for real; the guys even went out of their way to present each dish in French for me with a little help of Google translator. How often that happens to you in a restaurant, … in a Croatian restaurant?! We've dined there this past winter. 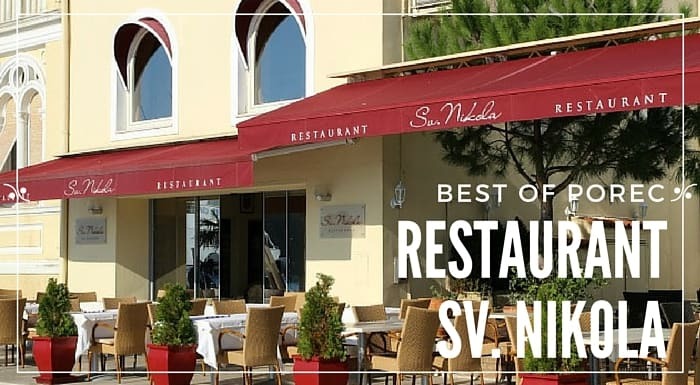 Sv Nikola is also one of the rare restaurants in Porec open all year. Winter is slow for businesses in Porec, especially during weekdays. However, Sv Nikola Porec remains open, and runs fixed-price daily menus. This means you can indulge in three-course fancy menu for only 100 kn (15€). Now, that's a good deal. During the summer, they do the same for lunch time when business is slow. Sv Nicola has a good balance of meat and fish dishes, as well as a choice of pasta dishes. As usual when given a choice, we've opted for fish dishes. While our food was prepared, we had a delicious amuse bouche to start. For an appetizer we went raw. We've chosen the Mare Nostrum seafood plate. It comprised of octopus, and sea bass carpaccio, raw scampi, and shrimp and scampi tartar. Yummy! Restaurant Sv Nikola Porec Croatia | Pin Me For Later! A dinner continued with a Vellutata, a creamy scampi soup. And for the main course we had a black squid risotto and homemade fuzi pasta with squids. Both dishes were delicious. We finished our meal with a nice black and white mousse. We had a lovely experience at Sv Nicola restaurant. Expect to pay around 250 kn per person with drinks. Highly recommended. Learn all Porec essentials with our Porec Travel Guide. Plan your activities in Porec with our detailed guide to things to do in Porec. Or check our list of things to see in Porec. If you plan to stay in Porec, consider renting our vacation rental. Or check a list of recommended accommodation in Porec. Find out where to eat in Porec with our post on best restaurants in Porec. Detailed info on Porec beaches you'll find here. A list of Porec bars and clubs. Staying in Porec for a day or two? Here is our post on how to spend 48 hours in Porec. Have a question, comment or suggestion about the restaurant Sv Nikola in Porec Croatia? Please leave it in the comments below. Frankaboutcroatia.com is a participant in the Amazon Services LLC Associates Program, an affiliate advertising program designed to provide a means for sites to earn advertising fees by advertising and linking to Amazon.com and affiliated sites. This post might also contain affiliate links to other sites, like accommodation or activities. And if you purchase anything using these links, we earn a little commission with no extra costs for you. Thank you for supporting our blog! I couldn’t agree more, Frank! I went there in June and had oysters for the first time – the food was absolutely amazing. Renting A Car In Croatia?